Every person is born perfect. Inferiority is a mistake of the mind, a cloud covering the light. Dissolve the clouds by observing a balanced life with healthy habits. Nourish your mind and body. Connect with your own inner self. Celebrate your own magnificence and your beauty will always shine through. True beauty to be supported by three pillars: Outer Beauty, Inner Beauty and Lasting Beauty. Only by enhancing all three can we attain the balanced state of radiant health that makes each of us the most fulfilled and beautiful person we can be. Avoid microwaving and boiling your vegetables. They lose as much as 85% of their antioxidant content when cooked in this way. Steaming and sauteing are best. Besides these general recommendations the key to Outer Beauty is to understand the difference in skin types so you can gain the maximum benefit from your individualized skin care regimen.three different skin types based on which of the three main metabolic principles (doshas) present in everyone, but to different degrees - is most dominant in your body. Vata is composed of the elements of air and space. If you have a vata skin type, your skin will be dry, thin, fine pored, delicate and cool to the touch. When balanced, it glows with a delicate lightness and refinement that is elegant and attractive. When vata skin is imbalanced, it will be prone to excessive dryness and may even be rough and flaky. Potential problems: The greatest beauty challenge for vata skin is its predisposition to symptoms of early aging. Your skin may tend to develop wrinkles earlier than most due to its tendency to dryness and thinness. If your digestion is not in balance, your skin can begin to look dull and grayish, even in your 20's and 30's. In addition, your skin may have a tendency for disorders such as dry eczema and skin fungus. Mental stress, such as worry, fear and lack of sleep, has a powerful debilitating effect on vata skin leaving it looking tired and lifeless. Recommendations for care - With a little knowledge, you can preserve and protect the delicate beauty of your vata type skin. Since your skin does not contain much moisture, preventing it from drying is the major consideration. Eat a warm, unctuous diet (ghee and olive oil are best) and favor sour, salty and sweet tastes (naturally sweet like fruits, not refined sugar) as they balance vata. Avoid drying foods like crackers. Drink 6-8 glasses of warm (not cold for vata types!) water throughout the day and eat plenty of sweet, juicy fruits. Going to bed early (before 10 PM) is very soothing to vata and will have a tremendously positive influence on your skin. Avoid cleansing products that dry the skin (like alcohol-based cleansers) and perform Ayurvedic oil massage to your whole body (abhyanga) in the morning before you shower. Pitta dosha is composed of the elements of fire and water. If you have a pitta skin type your skin is fair, soft, warm and of medium thickness. When balanced, your skin has a beautiful, slightly rosy or golden glow, as if illuminated from within. Your hair typically is fine and straight, and is usually red, sandy or blonde in color. Your complexion tends toward the pink or reddish, and there is often a copious amount of freckles or moles. Potential problems: Among the many beauty challenges of pitta skin types is your tendency to develop rashes, rosacea, acne, liver spots or pigment disorders. Because of the large proportion of the fire element in your constitution, your skin does not tolerate heat or sun very well. Of all the three skin types, pitta skin has the least tolerance for the sun, is photosensitive, and most likely to accumulate sun damage over the years. Pitta skin is aggravated by emotional stress, especially suppressed anger, frustration, or resentment. Recommendations for care - Avoid excessive sunlight, tanning treatments and highly heating therapies like facial or whole body steams. Avoid hot, spicy foods and favor astringent, bitter and sweet foods which balance pitta. (Again, naturally sweet, not chocolate and refined sugar!) Sweet juicy fruits (especially melons and pears), cooked greens and rose petal preserves are especially good. Drinking plenty of water helps wash impurities from sensitive pitta skin. Reduce external or internal contact with synthetic chemicals, to which your skin is especially prone to react, even in a delayed fashion after years of seemingly uneventful use. Avoid skin products that are abrasive, heating or contain artificial colors or preservatives. Most commercial make-up brands should be avoided in favor of strictly 100% natural ingredient cosmetics. And be sure to get your emotional stress under control through plenty of outdoor exercise, yoga and meditation. Kapha dosha is composed of the elements of earth and water. If you have a kapha skin type your skin is thick, oily, soft and cool to the touch. Your complexion is a glowing porcelain whitish color, like the moon, and hair characteristically thick, wavy, oily and dark. Kapha skin types, with their more generous collagen and connective tissue, are fortunate to develop wrinkles much later in life than vata or pitta types. Potential problems If your skin becomes imbalanced, it can show up as enlarged pores, excessively oily skin, moist types of eczema, blackheads, acne or pimples, and water retention. Kapha skin is also more prone to fungal infections. Recommendations for care - Kapha skin is more prone to clogging and needs more cleansing than other skin types. Be careful to avoid greasy, clogging creams. Likewise, avoid heavy, hard to digest foods like fried foods, fatty meats, cheeses and rich desserts. Eat more light, easy to digest, astringent, bitter and pungent (well-spiced) foods as they balance kapha. Olive oil is the best cooking oil and a little ginger and lime juice can be taken before meals to increase your characteristically sluggish digestive fire. Take warm baths often and use gentle cleansers to open the skin pores. Avoid getting constipated and try to get some exercise every day to increase circulation and help purify the skin through the sweating process. Happy, positive, loving, caring individuals have a special beauty that is far more than skin deep. Conversely we all experience the quick and deleterious effect on our skin from fatigue and stress. Inner beauty is authentic beauty, not the kind that shows on a made-up face, but the kind that shines through from your soul, your consciousness or inner state of being. Inner beauty comes from a mind and heart that are in harmony, not at odds with each other, causing emotional confusion, loss of confidence, stress and worry. Inner peace is the foundation of outer beauty. Maintain your self-confidence and a warm, loving personality by paying attention to your lifestyle and daily routine and effective management of stress (I highly recommend the TM technique for its scientifically-verified benefits on mental and physical health and reduced aging.) You will also be healthier and feel better through the day if you eat your main meal at midday and make a habit of going to bed early (by 10 PM is ideal.) Remember, kindness, friendliness and sincerity naturally attract people to you. On the other hand, being uptight or tense makes people want to walk the other way, regardless of your facial structure, body weight, or other outer signs we associate with attractiveness. 1. Eliminate toxins and free radicals in the body: The main deteriorating effects of aging come as toxins and impurities (called ama in Ayurveda) accumulate throughout the body. These toxins may begin as free radicals in the body, or over time may become oxidized into free radicals, all of which contribute to premature aging in the body. For lasting health and beauty it is essential to avoid and neutralize free radicals, to prevent impurities of all kinds from accumulating and to remove those that have already become lodged in the body. 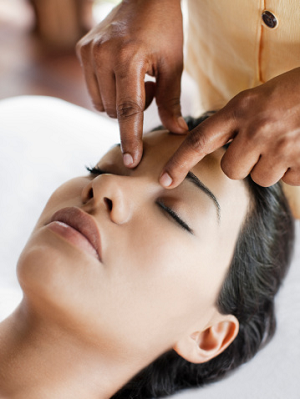 The most powerful cleansing therapy is "panchakarma" therapy, a series of natural treatments ideally performed twice yearly, that involves 5-7 days in a row of massage, heat treatments and mild herbal enemas. Ayurveda emphasizes the importance of undergoing this cleansing program once or twice a year to prevent impurities from accumulating, localizing and hardening in the tissues. Just as we change the oil in our cars regularly for optimal performance and lifespan, Ayurveda recommends that we cleanse the "sludge" from our tissues on a regular basis through panchakarma treatments. 2. Add Rejuvenative Techniques To Daily Living: The daily activities of life in the modern world systematically wear us down and speed up the aging process. Ayurveda maintains it is crucial to practice daily rejuvenative regimens to counteract the stressful wear and tear of everyday life. According to Ayurveda the most important rejuvenative routines for your life are: Go to bed by 10:00 PM. This simple habit is one of the most powerful techniques for health and longevity. 3. Meditate daily. Any meditation that does not involve concentration (which has been shown to increase anxiety) can be very helpful. I highly recommend the twice-daily deep rest and enlivenment of the Transcendental Meditation (TM) technique, whose benefits have been verified by over 700 published research studies. 4. Eat organic, whole fresh food that is freshly prepared. There is an Ayurvedic saying:"Without proper diet. medicine is of no use. With proper diet, medicine is of no need." Be sure to avoid those leftovers, processed and microwaved foods for better nutrition and vitality. 5. Perform Ayurvedic oil massage in the morning (abhyanga). Morning oil massage purifies the entire body, reduces anxiety and stress, helps prevent and heal injuries and supports circulation. It is especially helpful in creating a radiant complexion and keeping your skin youthful. Research shows it may also help prevent skin cancers. Arogyam Pure Herbs Face Pack for glowing skin. 6. Practice yoga asanas. Maintaining flexibility and circulation is key to health. Practice pranayama (yoga breathing) techniques. Pranayama enlivens the mind and body. Ideally practice the following sequence twice a day. Asanas, pranayama and meditation. For most of us, beauty is not a gift but a choice ! Please feel free to add your feedback on this topic & if you like it do share it with your friends !